The Balmoral Folding Armchairs are base around comfort with a curved lumber support on the backrest and smooth curved seat it has to be one of the most comfortable folding chairs around. The armchair also includes wide, ergonomically shaped arms that add to the comfort value overall. Hand made from the highest quality Teak with solid fittings to match it’s built for solid functionality that will last for years however often it’s used. The legs widen out at the bottom for added stability on both hard and soft surfaces and there’s a lockable clasp that holds the moving parts together when folded out. 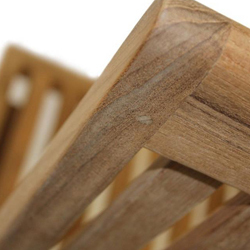 Our teak is of the highest quality every single time guaranteed. You are benefitting from over twenty years’ experience in sourcing this timber meaning we have an eye for the detail that is reflected in the quality of the manufacturers we buy from. Obviously, teak of this quality has all the natural qualities that make this timber perfect for outdoor use – high oil content and dense grain are abundant – meaning the Balmoral Folding Armchair can be left to the elements without adverse effect or need for maintenance. It will simply age gracefully to that silver-grey patina commonly associated with this timber. For cosmetic purposes you can refer to our Teak Care Advice on how to restore the wood to its original hue or to aid the ageing process. Please speak to our friendly Sales Team in the Midlands for further advice.